Below is another instance of notification -- in fact, the TWENTY-SECOND KNOWN VICTIM . . . and there are obviously MANY more. My name is Nancy Harvey and I live in Nashville, TN. I was checking my account activity in Gmail the other day and noticed that my email had been hacked by an IP stated to be in GA. Then in Fullerton, CA. Then Kansas. It is now stationary in Kansas. Finally after several attempts at geotracking, the address has been successfully traced to 8653 NW 120th Street, Potwin, Kansas. It says it is an IP address on ATT on someone's mobile. Mobile IP addresses are not static. They are impossible to trace. Looking up the streets shown and latitude/longitude, I traced it to this location. It shows the exact same farmhouse as listed on your website. I don't know why my email has been hacked, and I don't know this individual. Do you know anymore about this? 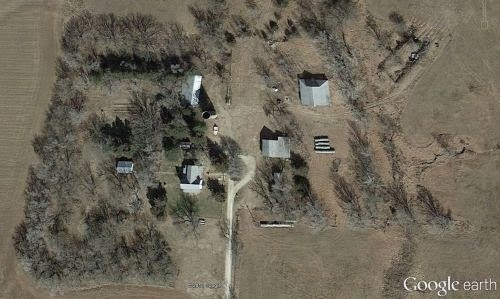 I don't know where to start other than after hours and hours of tracing an IP address, the geotracking shows it to be at the address of 8652 NW 120 St., Potwin, KS, the location of the farmhouse mentioned in your blogs. The IP address was listed in my gmail account activity. I thought someone had hacked my account. There is a lot of information about this farmhouse location on the internet. Would you please inform me what this is all about? I've read about your terrible predicament and I'm so sorry for your many woes.